Alright fellow foodies, I've added a few more burger joints since my first update. NOW, it's burgers burgers burgers for the next, what, three plus months? If you missed my little blurbs about the other candidates in my quest to find the best burger in San Diego, click here before reading on. Yes, I know. I had to do it. After finding out that they were voted the 'San Diego's Best Burger' by CitySearch Reader's Poll in 2009, I was sold. Also, that picture of the burger on their website makes me drool. I love Jayne's for their tasty steak frites, so why not try their burger? A recent visitor to my blog, itsmechuck, told me about Boomerang's off of Clairemont Drive. To tell you the truth, I had it confused with Boomer's off of Clairemont Mesa - duh! OK, after looking at their menu online, I am sold. Plus, he told me that Boomerang's won the San Diego Burger Challenge last year. Junvi emailed me about this new restaurant in Point Loma that just opened yesterday (4/19). Their website design easily convinces me to try a 10 oz. 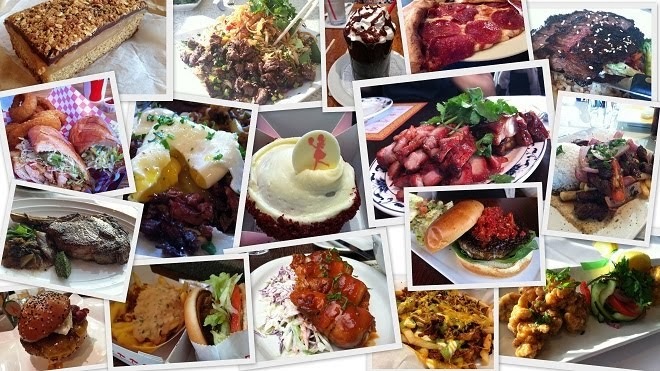 JFAT burger and many of their comfort food specialties. JFAT, I will visit soon. Mike and I have seen the Red Fox Room off of El Cajon Boulevard in North Park and we've been curious. It looks like it's been at that location for years and it looks totally old school. When Jen suggested that I go here as a part of the quest, I definitely put it on the list! Also in North Park, my friend Q mentioned that this place serves "alternative" burgers like ostrich, kangaroo, bison, and alligator *shudder* when we walked past it during an evening stroll to Jayne's. Coincidentally, Jen and my foodie friend, Raymond, suggested it to me too. However, to be fair to the other candidates, I would be ordering a plain ol' cheeseburger from here, but will be back for a different taste later. My favorite college buddy, Shaye, reunited recently and upon hearing about my quest, she told me about The Counter in Carlsbad. Guests have the option to build their own burger, with a dozen types of cheeses, many unique toppings like dried cranberries & hard boiled egg, and large variety of sauces. They also have their list of signature burgers and a few sandwiches. Carlsbad is a bit of a drive from where I live, but if it's where the best burger may possibly be, I'm down. Can't believe I almost forgot about this place. Shame on me! The Lodge at Torrey Pines is where Mike and I stayed the night of our wedding. *cheesy smile* The minute we arrived, we told the front desk that we were starving. He told us that we had to get the Drugstore Burger and that is exactly what we did. Yum. Along with homemade potato chips & buffalo wings. Yeah. Happy wedding day for us! Oh, Urban Mo's... I visited a lot when you were Hamburger Mary's and I think I've only gone back once since the name change. I have had their burgers here, but sadly, I have forgotten the flavor since it's been a while. Raymond suggested I give it another whirl and to try their Mediterranean burger. I've been told that this joint has the greasiest, but tastiest burgers in San Diego. I mean, a grilled pastrami burger? Wha? Heart attack in a bun, but yes, I have to admit, I love pastrami and I love burgers. This type of burger will not be a part of my quest, but I do have to visit to see what the hype is about. So, alas.. the final list. For those who would like to join in on the quest, let me know by leaving a comment, DM on Twitter, or email me. Remember, ratings can be done on your own time -- and for sure, it will take me a *long* time to visit all these burger joints. To those who are already participating... rating sheets will be sent to you SOON and I will be scheduling a few burger outings. Yay! It is a good thing that I am a runner. Yeah, it really is. Shaye, yes, let's! That will be our next adventure! Check your calendar. I would love to participate on your burger quest! That's a lot of times how I first judge a restaurant - by their burger! Let me know if I can still join you on this adventure! My hubby is a self-proclaimed burger aficionado and we've been on the quest for the best burger as well. In the gourmet burger category, I think Whisknladle is number one by a long shot -- it's always prepared perfectly (plus, the meat is humanely raised); Zel's Del Mar is a strong contender. Rocky's serves a heck of a burger (dry aged beef variety) which, despite the incorrect opinions of some, trumps Hodad's for its deliciousness and consistency. Hodad's is inconsistently good. If you're in L.A., Rustic Canyon's burger is darn fine. By the way, if you haven't tried the crab or crab cake sandwich at Point Loma Seafood, go immediately. Also, the tuna melt at Prepkitchen, which is one of the best sandwiches in San Diego. Brook, wow, only if I known of Zel's Del Mar sooner! I will still definitely check it out. In L.A., I've been told that the Father's Office is quite outstanding. I will put Rustic Canyon on my L.A. list. Thanks for the visit! The Waterfront is definitely at the top of the list. Just because it's a dive bar it doesn't lessen it deliciousness. They consistently are nominated for best burger throughout town. I can honestly say that I have never had a bad burger there. Everyone tries to create awesome burgers by adding overpowering breads or sauces or something, Watefront burgers just plain taste amazing. I'd recommend the Blue Cheese Bacon Burger if you're super hungry or mini-bacon if you're a little hungry. PS it's the oldest bar in SD, so it has street cred! Malou, see you in July! :) Can't wait! I just found your site while looking up something else. I have one suggestion - for those of us in East County - Johnny B's Burgers and Brew in La Mesa serves the best burger around. I'm surprised it is not on your list, as it generally shows up on "best of" lists for burgers in the San Diego area. Happy Eating! Hi, Anonymous! Thanks for the visit and for the suggestion about Johnny B's! I will add this place to my 'will go' list for a great burger. For my quest, I took suggestions from people and didn't do much research on my own. Johnny B's will definitely be a treat for me to blog about! :) Thanks, again!